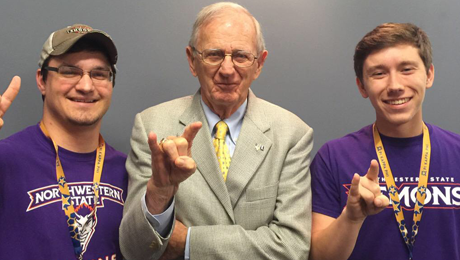 Members of the Beta Omicron chapter of Pi Kappa Phi Fraternity are ready to bring a new style of leadership to Northwestern State University. Sophomores Thomas Marlbrough, Dalton Randolph, Michael Dailey, William Devall, and David Johnson are among the 100 of Pi Kappa Phi Fraternity’s nearly 12,000 undergraduate members selected for Pi Kapp College for Emerging Leaders, an intensive, six-day leadership development experience that empowers participants to create the ideal chapter. Two sessions were held June 6-12, 2015 and June 13-19 at the University of South Carolina. The program is designed to challenge and inspire participants to become better leaders and better men. Student participants were assigned to small groups consisting of 10 Pi Kappa Phi members from around the country, led by two faculty. The facilitation team, made up of friends of the Fraternity and alumni, provided a wealth of knowledge to attendees, including decades of higher education and leadership development experience to challenge and support the men. Beta Omicron chapter alumni Wes Breeden, a regional vice president with AMBA; Lane Luckie, a news anchor for an ABC Television affiliate; and Nick Breaux, director of chapter services for The Ability Experience; all served on the faculty for Session I. 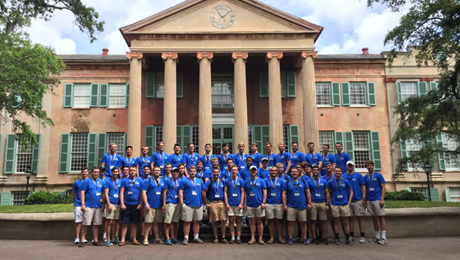 The week included small group discussion, large group education sessions, a challenge course, unique subordinate rituals, and an insider look at Pi Kappa Phi’s history on the nearby College of Charleston campus. The Fraternity was founded there in 1904, making the physical setting an important element of the program. “Seeing where the Fraternity was founded was an amazing experience that made me closer to my brothers and my fraternity,” said Randolph, a rising sophomore who is involved with the NSU theatre program. As the week progressed, men were challenged daily to learn and reflect on their own morals and strengths as well as the values of the fraternity. One of the most impactful experiences at Pi Kapp College was a friendship visit with the Arc of South Carolina, which provides services to people with disabilities. The students and facilitators traveled to a bowling alley in Columbia for an afternoon of fun with the organization’s clients. “It definitely opened my eyes to a different view of people with disabilities,” Dailey said. Pi Kapp students bowled with their new friends, high-fiving after each frame, all while learning an important lesson in empathy and putting the abilities of others first. Attending Pi Kapp College is an honor in itself. Students are selected through a rigorous application process, involving interviews and essays. Graduates leave with an increased commitment to acting consistently with their core personal values and values of Pi Kappa Phi, enhanced abilities to develop and enrich relationships as well as a strengthened commitment to respecting the dignity of all people, and embraced belief in aspiring toward the “ideal chapter”, and developing the capability to move a plan into action. “I learned how to handle accountability and that we need a goal to work toward,” Dailey said. 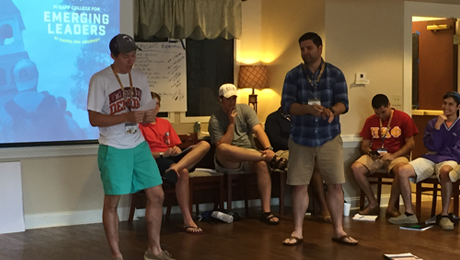 Pi Kapp College has proven to be one of the fraternity’s most impactful ― and most enduring ― leadership experiences. Since its redesign in 2010, nearly three-quarters of all Pi Kapp College graduates have gone on to hold leadership positions in their chapters or campus communities. The five NSU students were able to attend the program, in part, due to the generosity of the Beta Omicron Alumni Chapter, which sponsored the airfare for each of the participants. June 19, 2015 in Leadership.